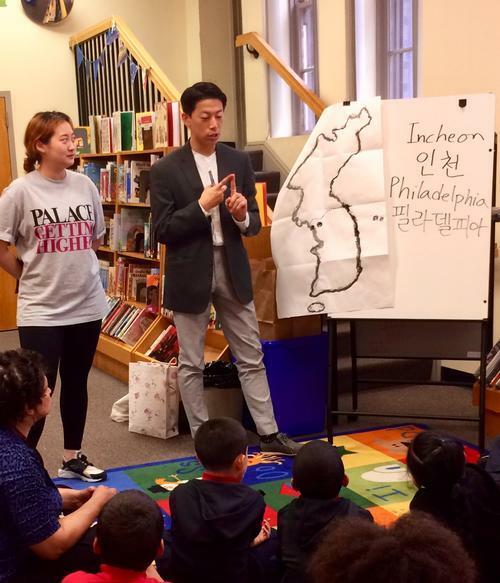 This October, first and second grade students in the Building Bridges with Books program (a partnership between the Free Library and the School District of Philadelphia) got a unique glimpse into the life and culture of one of Philadelphia’s Sister Cities: Incheon, South Korea. Building Bridges with Books partnered with Citizen Diplomacy International of Philadelphia to develop a series of interactive workshops for some of our youngest citizens to share the stories, culture, and arts of Incheon. These workshops, led by student volunteers from the University of the Arts in collaboration with Free Library staff and librarians, sought to build awareness and connection to our Sister City as part of Citizen Diplomacy International’s "Spotlight on Incheon" initiative this year. Over the course of four workshops at Haverford Library and Queen Memorial Library, almost 100 students heard traditional Korean folktales like "The Tale of Rabbit and the Dragon King," saw demonstrations of authentic Hangul text (the Korean alphabet), discussed similarities and differences between Incheon and Philadelphia, and created their own handmade paper trays using traditional Korean mulberry paper and decorative designs. Delores Solomon, a BBWB Parent Ambassador at McDaniel Elementary who chaperoned one visiting class, said, "The students and teachers just loved the workshop, and what they made!" All four workshops were co-led by Luke Han, a senior at University of the Arts, originally from Daejeon, and Yena Park, a recent University of the Arts graduate and native of Incheon. Han and Park worked closely with our librarians to create an eye-opening and engaging experience for these students. Han found sharing the culture of Incheon and South Korea with students to be a positive experience, saying, "[The students] were really interested in learning about a different city and culture, and that was really rewarding for me, as a Korean living here. Maybe it was a lot for them, but they understood it well." For more information about Building Bridges with Books and our work connecting students and their families to the resources of the Free Library, please contact Youth Services and Programs at 215-686-5372. Yena Park and Luke Han, two University of the Arts student volunteers, introduced Building Bridges with Books students to the geography and language of Incheon, Korea. 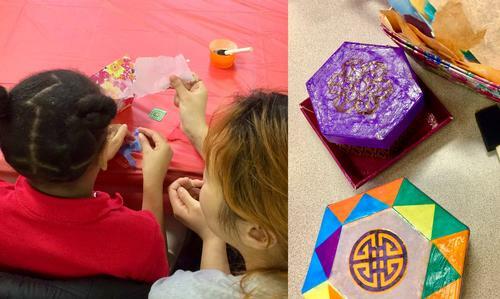 Yena Park helped students explore traditional materials and techniques to create mulberry paper trays. 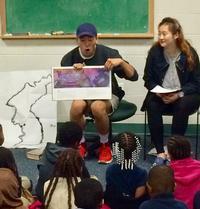 Workshop leaders and FLP librarians read traditional and contemporary Korean stories to students.